Scrum is not a goal in itself, Scrum is a mean. Scrum is a path that a person, a team, an organization takes toward increased competitiveness, higher responsiveness, more learning, more creativity, optimistic opportunism, a sustainable way of working, restored respect for people. Scrum is a journey toward increased… agility. I have written a book about Scrum, published on 4 November 2013. As Scrum is designed to help people, organizations and teams embark on a journey, my book is a smart travel companion for that journey. My book is a pocket guide that can help you prepare, take off, and get going. And while on the road you can always have a quick peek again to find your way or re-orient. Scrum. This chapter describes the roots of Scrum, the basic rules, roles and principles of the game, and the values underpinning the Scrum framework. Tactics for a purpose. This chapter introduces some common ways to play the game of Scrum. They are presented as tactics that are not formally prescriptions of the Scrum framework, not part of the rules of Scrum. The future state of Scrum. This chapter holds a look into the future and some evolutions I expect to happen. Other appreciated reviewers were Ralph Jocham, Agile professional and Professional Scrum trainer, and Patricia Kong, director of partners at Scrum.org. Ralph says this is the book he will advise his students, coachees and organizations to read in order to learn the essential Scrum. Patricia says she would have loved to have this book when she entered the world of Scrum. Because she didn’t find one at the time. 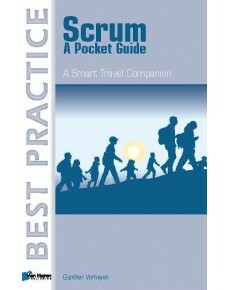 The book, “Scrum – A Pocket Guide (A Smart Travel Companion)” will be published by Van Haren. My gratitude goes out to their team that has made this possible! Pre-order your copy at Amazon (UK) or at the publisher’s webshop.